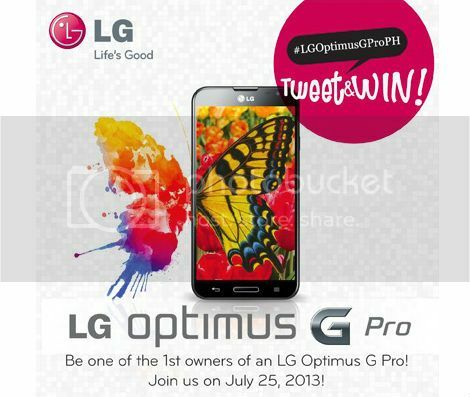 #LGOPTIMUSGPROPH: LG Launches LG Optimus G Pro with a TWEET & WIN Promo! LG Philippines after hinting on the release of “What’s Next?” on their FB page, has finally unveiled the LG Optimus G Pro locally. And that’s not just it, LG’s actually having a TWEET & WIN Promo to give away the first of its kind, the LG Optimus G Pro on July 25, 2013! #LGOptimusGProPH is/has/will be ___________ @LGPhilippines! You can send entries only within 12:01AM to 11:59PM of July 25, 2013. Take note that it has to be on the date only, and not before or after, or it will be considered as invalid. You can send more than one (1) entry, but you can only win once. There will be eleven (11) winners, with the 1st Place prize of LG Optimus G Pro and the other ten (10) with 3 tickets to a One Day Pass on Ayala Museum each. You can check out the winners after 3 business days via LG Optimus PH FB page, Twitter and Instagram account @LGPhilippines. Acer Iconia W3 Exclusive from Smart Bro Plan at Php1,249/Month Only!